1.The Bloody Handprints And Footprints Made Of Eco-Friendly PVC And Reusable. Can Be Removed Without Leaving Residue. Removes Easily Just Peel And Stick. 2.The Bloody Stickers Can Be Stick On Any Clean And Smooth Surface, Such As Wooden Floors/Door, Mirrors, Bathroom Glass Door, Kitchen Cabinets, Windows, Staircase Etc. 4.The Perfect Choice - Vivid Bloody Red Hand/Foot Print Looks Real And Increase The Atmosphere Of Halloween Full Of Terror. The Bloody Handprints And Footprints Made Of Eco-Friendly PVC And Reusable. Can Be Removed Without Leaving Residue. Removes Easily Just Peel And Stick. 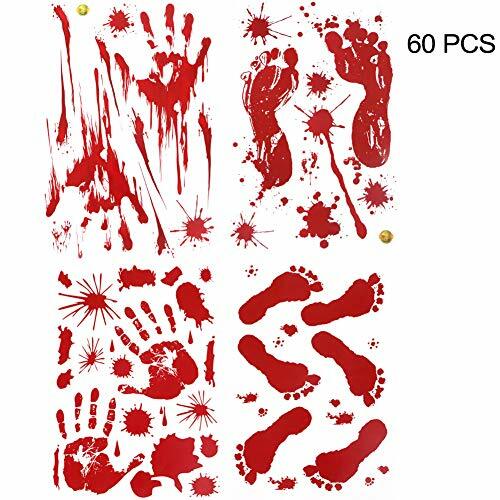 The Perfect Choice - Vivid Bloody Red Hand/Foot Print Looks Real And Increase The Atmosphere Of Halloween Full Of Terror. If you have any questions about this product by YuBoBo, contact us by completing and submitting the form below. If you are looking for a specif part number, please include it with your message.